23rd day of the 3rd lunar month of 1841 : born in Nagasaki. He was the last child of a doctor named Fukuchi Kuan. His yômyô was Yasokichi. March 1890: premiere at the Kabukiza of Fukuchi Ôchi's drama "Sôma Heiji Nidai Banashi", a revision of Chikamatsu Monzaemon's 1724 drama "Kanhasshû Tsunagi Uma". July 1890: Fukuchi lost his manager role of the Kabukiza and became a simple sakusha, then the tatesakusha of the Kabukiza. March 1891: premiere at the Kabukiza of Fukuchi Ôchi's drama "Buyû no Homare Shusse Kagekiyo", a revised revival of Chikamatsu Monzaemon's jidaimono "Shusse Kagekiyo" [casting]. June 1891: premiere at the Kabukiza of Fukuchi Ôchi's drama "Kasuga no Tsubone". September 1891: premiere at the Kabukiza of Fukuchi Ôchi's drama "Zôho Onna Narukami" [more details]. March 1892: premiere at the Kabukiza of Fukuchi Ôchi's drama "Motome-zuka Migaeri Nitta", a revision of Chikamatsu Monzaemon's 1710 drama "Yoshino no Miyako Onna Kusunoki". October 1892: premiere at the Kabukiza of Fukuchi Ôchi's matsubamemono "Suô Otoshi", starring Ichikawa Danjûrô IX and Nakamura Fukusuke IV in the roles of Tarôkaja and the Princess. March 1893: premiere at the Kabukiza of Fukuchi Ôchi's Nagauta-based dance "Shunkyô Kagami Jishi". The musical accompaniment was written by Kineya Shôjirô III, the choreography was made by Fujima Kan'emon II and the leading role was danced by Ichikawa Danjûrô IX. May 1893: premiere at the Kabukiza of Fukuchi Ôchi's drama "Jûnitoki Kaikei Soga", a revision of Chikamatsu Monzaemon's 1718 drama "Soga Kaikeizan". September 1893: premiere at the Kabukiza of Fukuchi Ôchi's drama "Ôkubo Hikozaemon" with Ichikawa Danjûrô IX in the eponymous role of Ôkubo Hikozaemon. April 1897: premiere at the Kabukiza of Fukuchi Ôchi's drama "Otokodate Harusame Gasa" [more details]. October 1897: premiere at the Meijiza of Fukuchi Ôchi's dance-drama "Ômori Hikoshichi" [casting]. November 1897: premiere at the Kabukiza of Fukuchi Ôchi's drama "Shihei no Nana Warai", a revision of the second act of Namiki Gohachi's drama "Tenmangû Natane no Gokû"; the Meiji star Ichikawa Danjûrô IX played the role of Fujiwara no Shihei. 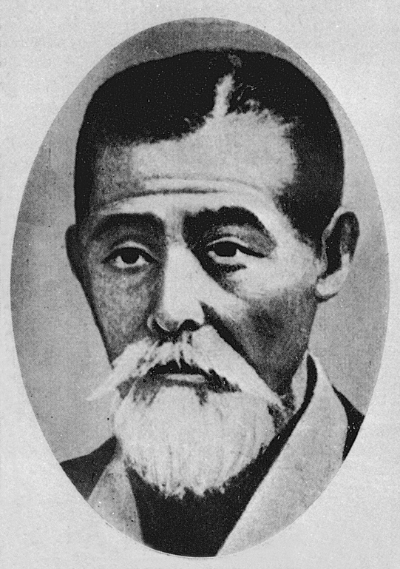 4 January 1906: Fukuchi Ôchi died in Tôkyô . Fukuchi Ôchi worked on more than 40 Kabuki plays. Many of them were katsureki written specifically for the Meiji star Ichikawa Danjûrô IX. He heavily revised dramas written by Chikamatsu Monzaemon or Kawatake Mokuami, earning the nickname of kaisaku koji (The Adapter), then kaiaku koji (The Worse Maker). The 23rd day of the 3rd lunar month of the 12th year of the Tenpô era was the 13th of May 1841 in the western calendar. His tombstone is located in the cemetery of the Tennôji temple in the district of Yanaka (Tôkyô).